In order to evaluate the optical quality of intraocular lenses (IOLs), Modulation Transfer Function (MTF) is nowadays an international approved scientific method.1,2 MTF, expresses the variation of image contrast with spatial frequency for an object with 100% contrast.3 The MTF measurement at a particular spatial frequency is called the Through Focus MTF (TF MTF) and it gives information about the depth of focus (DoF) that is provided by an optical system (an IOL in this case). The axial MTF is the measurement of MTF within a defocus range, for a range of spatial frequencies. Successively measured axial MTFs, create a surface (figure 1) that gives information both for MTF and TF MTF configuration at the same time. Taking advantage of this surface, a new metric was developed in order to determine quantitatively the optical quality of IOLs by calculating the volume under the surface. Setting defocus intervals makes possible to isolate and calculate the volume under any desirable vergence of an IOL, providing this way valuable information about defocus tolerance and optical quality. Furthermore, this new metric and can be generalized and assess the optical quality of any optical system by means of axial MTF. Figure 1. 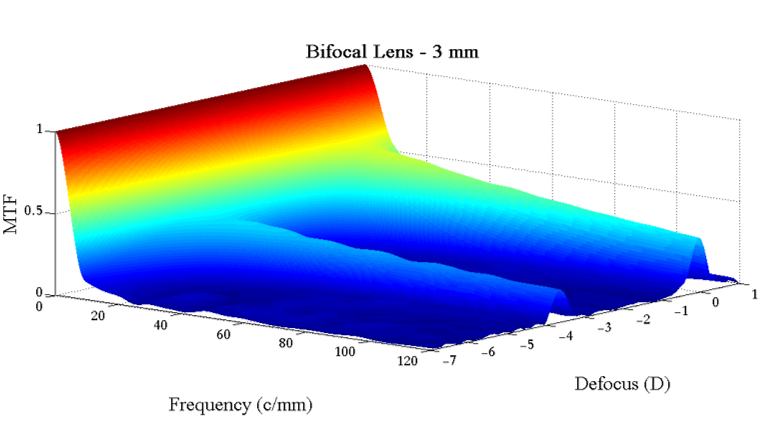 Representation of the axial MTF configuration of a bifocal IOL for the 120 c/mm spatial frequency for a 3 mm aperture. International Organization for Standardization. Ophthalmic Implants-Intraocular Lenses-Part 2: Optical Properties and Test Methods. Geneva, Switzerland, ISO, 1999 (ISO 11979-2); technical corrigendum 1, 2014.
International Organization for Standardization. Ophthalmic Implants-Intraocular Lenses-Part 9: Optical Properties and Test Methods. Geneva, Switzerland, ISO, 2006 (ISO 11979-2). Thibos, Larry N., Xin Hong, Arthur Bradley, and Raymond A. Applegate. Metrics of Optical Quality of the Eye. Fort Lauderdale, Florida: ARVO, 2003.